If you’ve tried one of the Chombart-designed, CG X-Treme Mod 22 triggers*, you know it is one of the best two-stage triggers you can buy. Now there’s a model, adjustable from 0.5 to 3.5 pounds pull weight, for shooters who prefer single-stage operation. 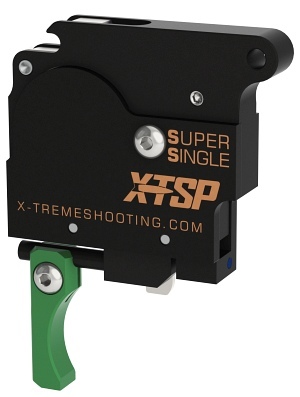 This single-stage trigger will be offered by X-Treme Shooting Products (XTSP) in three versions, two with an integral lever-style safety. You can choose an adjustable trigger shoe (shown at right) or a conventional solid-style shoe. The trigger offers over-travel adjustment. That’s important — we’ve found some shooters like minimal over-travel while other shooters want to be able to pull smoothly past the break point. We expect to see this new trigger used in F-Class rifles as well as mid-range and long-range benchrest rigs. 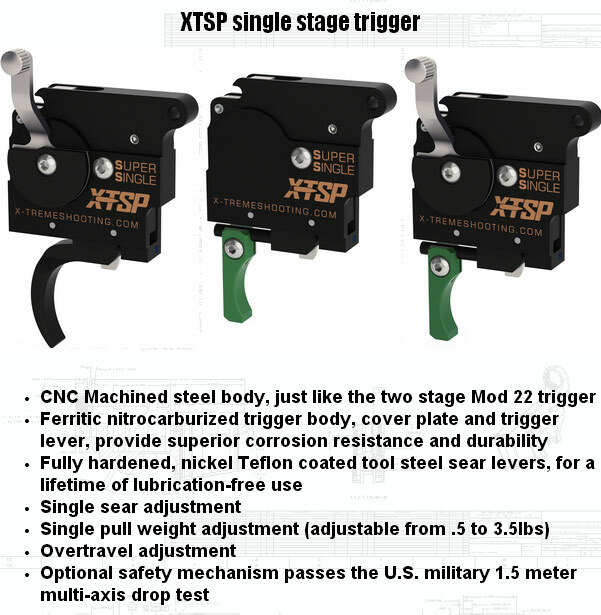 The sears are nickel + Teflon coated, so the XTSP single-stage trigger can work smoothly with zero lubrication. That helps the trigger stay gunk-free even in dusty conditions. The new trigger boasts a rugged CNC-machined steel body, just like the two-stage Mod 22 trigger. This new trigger should be available before the end of the summer. Mod 22 two-stage triggers cost $300.00-$350.00. We expect the new XTSP single-stage triggers to retail at roughly the same price point, but that’s a guess. *The CG Mod 22 trigger was originally designed by Robert Chombart of France and updated by X-Treme Shooting Products for the U.S. market. The Model 22 trigger is the successor to the popular CG Jackson trigger also known as the Mod 21. The Mod 21 was designed to be universal and fit a variety of popular actions. However, in the Remington action, the Model 21 had clearance issues when installed in repeater rifles. The Mod 21 trigger is no longer manufactured. The Mod 22 target trigger is a 2-stage, 4-lever trigger for Remington 700 actions and Rem 700 clones. The Mod 22 tactical trigger utilizes 3 levers to increase the final pull weight. Both Mod 22 trigger versions feature a re-designed upper frame to fit into the receiver with two cross pins. This eliminates clearance problems with internal box magazines or detachable box magazines. Share the post "New Single-Stage Trigger for Match and Tactical Rifles"
Got a 1911-style centerfire pistol? Would you like to cross-train with an ergonomically-identical rimfire version that lets you shoot less-expensive .22 LR ammo and not worry about recovering your brass? 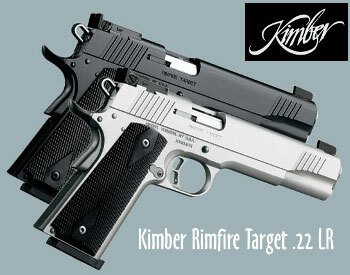 Well check out Kimber’s Rimfire 1911s. 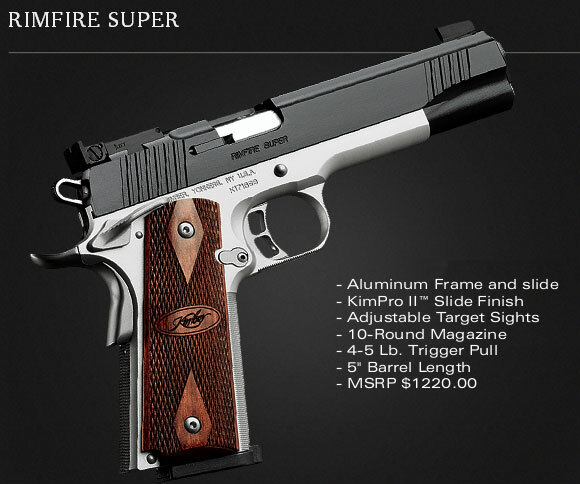 We think John Moses Browning would smile at this adaptation of his classic 1911 design. Kimber’s line-up of rimfire pistols includes matte black and silver-tone Rimfire Target models ($871 MSRP), plus a deluxe, two-tone Rimfire Super model ($1220 MSRP) with Rosewood grips, front strap checkering, and KimPro II finish. Shown above, the Rimfire Super model is guaranteed to put five shots in 1.5″ or less at 25 yards. Both standard and deluxe models feature aluminum frame and slide, steel barrel, and adjustable match-type sights. While viewing Panteo’s Training with a 22 DVD, we noticed a sweet-looking, silver-tone m1911-style rimfire pistol in the hands of host Michael Bane. 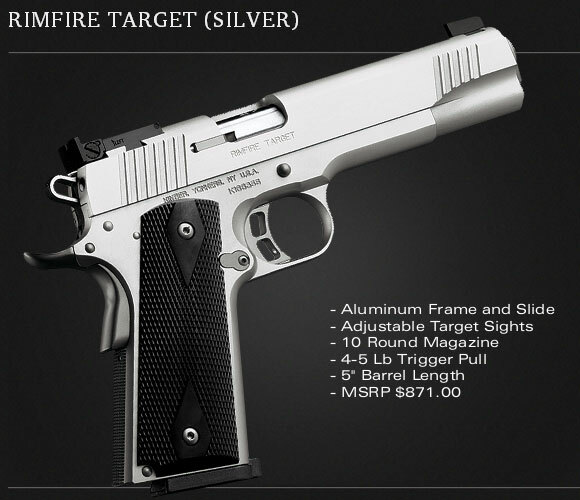 At first, we thought this might be a new stainless version of Sig Sauer’s popular 1911-22. But, in actuality, Bane was shooting a Kimber Rimfire Target pistol. Michael’s aluminum-framed Kimber performed great in rapid-fire drills. See one in action below. Share the post "Yes, Honey, I Need Another Pistol… (A .22 LR 1911)"
Add the Washington Post to the growing list of sources that credit President Obama with being the best salesman for firearms and ammunition that the country has seen since Samuel Colt. Using a simple linear trend analysis based on NSSF-supplied data, Washington Post writer Philip Bump calculated that the U.S. firearms industry has enjoyed a $9 to $10 billion increase in sales of guns and ammo during President Obama’s terms in office. CLICK HERE for full story in Washington Post. Take a look at this chart — it shows a huge increase in sales of long guns, handguns, and ammunition during the Obama presidency. (NOTE: There is a decline at the extreme right of the chart because 2014 data only goes through the third quarter of the year.) You can seen why there have been shortages of ammunition. Look at the huge spike in ammo sales (orange zone) over the past six years. This may explain why some retailers ironically refer to the nation’s top elected official as “President ObAMMO”. Share the post "The Best Gun Salesman Since Samuel Colt"